Of all the pitches in baseball, how to throw a Knuckleball is the hardest pitch to learn and master, which could take a pitcher years of practice and still end in failure. Why even think of making such an investment in time and energy? Because without an argument, a properly thrown knuckleball is nearly impossible to hit, much alone hit with any authority. Power and knuckleball are very rarely ever used in the same sentence. Scientifically speaking, the physics of explaining a knuckleball goes something like this. (1.) A properly thrown knuckleball has little to no spin or rotation to the ball, it actually sort of floats through the air. (2.) As this floating ball proceeds, a pocket of swirling air forms behind it, as the ball slightly rotates, from the pull of the air gap, this pocket of swirling air grows larger, smaller, and moves back and forth across the ball. (3.) While air is dragging over the smooth raw hide cover of the ball, the seams introduce swirls and ripples of air which change as the ball is pushed side to side from the affects of the pocket of air behind it. You got that? I’m not sure I do. Let’s try again. 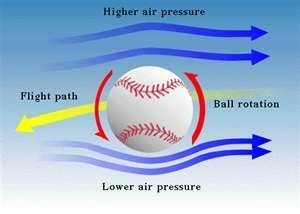 When a baseball is thrown with little to no rotation, the affects of air make the ball dip, uplift and move side to side as it travels toward the plate. It literally resembles a butterfly, dipping and darting as it approaches the plate at a slower rate of speed than a normal change up. If thrown correctly a batter can’t hit the ball and the catcher can’t catch it. So how do you throw a knuckle ball? 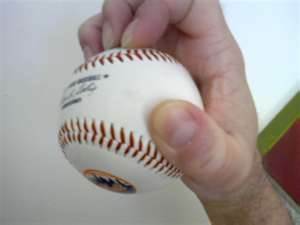 Well, number one it’s not with your knuckles and off the top of my head I have no idea how it acquired it’s name, but the grip is the most important aspect of being able to throw a floating knuckleball. (1.) 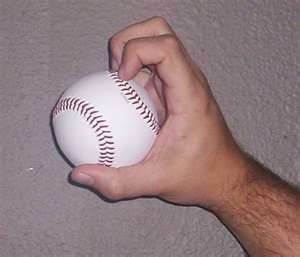 First, hold your thumb and first two fingers of your throwing hand out and place the tips of these fingers and thumb on the baseball, but not holding any seam. (2.) Then, with your left hand, push the ball back into your palm, never removing your fingers, which will cause the fingers will curl. (3.) Use your ring finger and pinky to steady the ball and keep it from coming out of your hand. You don’t have to use the ring finger and pinky to steady the ball. If only one, either one, feels more comfortable …use it. (4.) Perhaps surprisingly, the pitching motion and arm speed for throwing a knuckleball is no different than any other pitch, because it’s arm speed that creates the momentum for the ball to travel. (5.) However, the release is totally different. Because of the unusual grip, as you approach your release point the ball will begin to fall forward out of your hand. At this point you will release the baseball with a flicking motion of your two fingers and thumb, similar to flicking water off your fingers. (6.) Do not snap down on the wrist, like throwing a fastball, however, you don’t want the wrist rigid as if you were throwing a shot put. Because you won’t be snapping the wrist you’ll release the ball slightly sooner than if you were throwing a fastball. The two fingers and thumb must remain in contact with the ball and release the ball at the exact same time. This triangle position and release is what prevents the ball from rotating, which gives it it’s butterfly effect. Should the release not be near perfect, the ball will begin to spin, which will result in little movement of the ball, which will have similar results as a hanging curve ball … you’ll dodging screaming line drives, as the hitters drive the ball back up the middle. You can see by the complexity of the explanation of how to grip and throw a knuckleball, the extreme difficulty in learning to master the pitch, and if you don’t master it, don’t throw it with any regularity. It’s alright to sneak it in every now and then, as it can be effective as an off speed pitch. We talk about the pitcher and catcher as a Battery, each affected by what the other does, and there is no greater example of this than a pitcher with an excellent knuckleball. To illustrate my point, if a major league team has a knuckleball throwing pitcher on their staff, they will have specialized knuckleball catchers mitts, which is an oversized mitt, in their equipment locker, to help the catcher catch the pitcher. 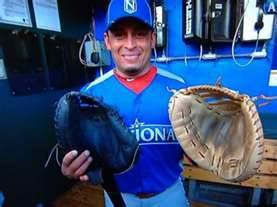 This specialized equipment by no means guarantees the catcher will cleanly catch the ball, but it helps. As the catcher, you will have an urge to reach forward and snap the ball out of the air as it approaches the plate. Don’t do it! Imagine waiting for a hovering butterfly to land on you instead of stabbing out at it, allow the ball to come to you. One last tip. If the pitcher is really on and the pitch is dancing, try to replace the mental attitude of catching the ball with a Knock it down and don’t allow it to get past me attitude.